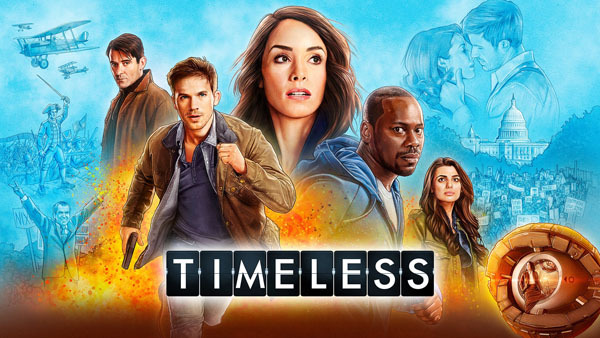 Season Two of Timeless premiered last Sunday night. I deliberately had not watched Season One since I bought the DVDs, because I wanted to semi-binge-watch it prior to watching Season Two’s first episode online (“semi” because it took me a week rather than watching the episodes straight through). I wanted to approach the series fresh and see if any of my opinions had changed. I found I still had the same frustrations with Season One that I’ve mentioned in previous posts. Mostly, this has to do with too much dialogue of the: “you must help me/do what I tell you because I know things you don’t — and I can’t tell you what those things are, so just trust me — even though I’ve given you absolutely no reason to do so” –type. But what struck me even more strongly during my season one re-watch was, time travel stories are difficult. I’ve read and watched a lot of time travel fiction (it’s a thing with me). As far as I can tell, most time travel stories fall into one of two basic types. The first type is the clever brain teaser (or tries to be) where the plot hinges on things coming together (or coming apart) neatly like a puzzle box. In general, things were actually always meant to happen the way they do because, hey, you really can’t change the timeline. The second type is a whole lot more messy and allows for changes to the timeline. So far, Timeless appears to fit into the second type. Timeless is no exception. The one big rule here is “you can’t travel to a time where you already exist.” This prevents our heroes from changing things within their own lifetime (i.e. their “birth to death” years) and prevents going back to a time they’ve already traveled to and trying to fix whatever they screwed up. But that single big rule means that the writers have to bend over backwards to hand wave away other logical solutions as not feasible. The most egregious of these is that nobody realistically asks/answers the $64,000 question: “why the hell don’t we train a second time team?” Having two teams would mean the backup team could try for a re-do when the primary team screws up. Talk about a plot hole you could fly the space shuttle through. And yet… I’ve come to accept that I love this show even with all it’s plot failings. The big question is why? I fell in love with the characters despite the flawed execution of the premise. The characters and their emotional arcs and relationships make watching this show worth my time. And that’s a great lesson for a writer to learn. The second season premiere gave me everything I was hoping for after the cliffhanger that was the last few minutes of Season One. The good guys stayed the good guys (though even more battered than before), and the people I’d grown to dislike over the entirety of the first season (I’m looking at you, Lucy’s mother) justified my growing hate. So long as the writers continue to deliver on the character side, I’ll (mostly) let them get away with more plot contrivances (though I truly hope they’ll be very minor and few and far between).